Tips For Cleaning Your Home After Water Damage. Disconnect the power, unplug any electronics, and remove electronics, furniture and movable items immediately. Contact your insurance agent. Get rid of the standing water. Use towels, buckets or a shop vacuum for smaller pools of water. A submersible pump will be required for larger floods. 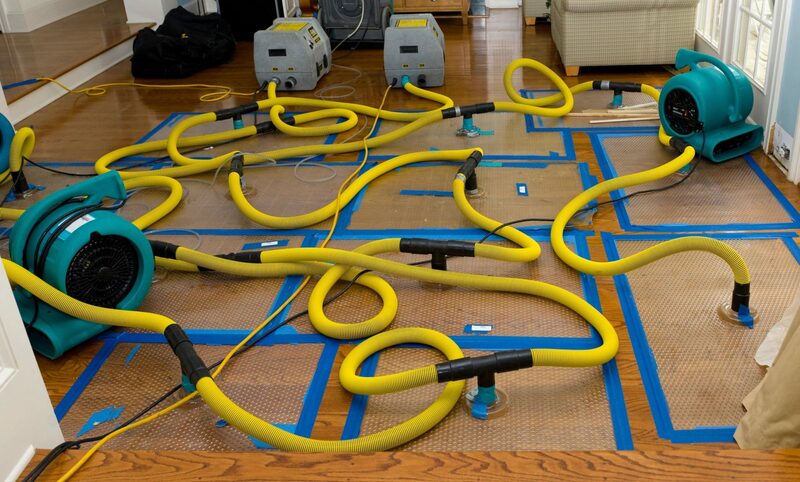 Dry out the affected area using fans and a dehumidifier to help speed up the process. If needed, removed water damaged drywall and insulation. Get access to water behind walls and begin drying out the structure. Clean & deodorize the affected areas. Use disinfects for Category 3 water damage. Be sure to follow label directions. Prevent mold and fungus growth. Only if it necessary, use a biocide or fungicide. Follow label instructions. Dispose of damaged items. Contact your garbage provider for further information. 1Do I need an estimate before you start the dry-out? Quite often the precise costs for emergency services such as water mitigation are unknown until work begins and progresses to conclusion. Most likely, LBR Restoration uses the the same system and pricing schedule as your insurance carrier. Your insurance will be reviewing and approving our invoice. When an adjuster is assigned to the claim, LBR will explain to them what we have done up to that point and seek authorization before further steps are taken. 2How long will the dry out take? Typical drying times for residential water losses range from 3 to 7 days. There are many variables that can affect the dry time. Most importantly, LBR inspects progress daily and only stops when the structure is dry. 3Can my family stay in our home during the drying or reconstruction process? This is a judgment call that only you can make. Factors such as, health and safety take highest priority. Furthermore, essential spaces like kitchens and bathrooms can influence your decision. For example, if an entire main floor is affected and appliances will be disconnected and your only bathroom is out of commission, you probably will want to stay off-site. Most often, your insurance company will reimburse you for reasonable hotel and meal costs (usually on a per-diem basis) during the project, but only your insurance carrier can provide those details. 4Will my insurance company pay for water damage cleanup and repairs? Each insurance carrier is different, and each policy can also have specific language regarding coverage for certain types of water damage. Insurance coverage usually has to do with the CAUSE of the loss, not how bad it is or how long you’ve paid premiums with the company with no claims. Keep in mind that ONLY your insurance company can tell you that a particular loss may be covered or not, so until an adjuster is assigned, we may not be able to get you all the answers you need immediately. 1Should I be concerned about mold? Typically, mold requires 48-72 hours after a clean water loss to start to grow in the right environment. Mesophilic mold grows best in a temperature range of 68º to 86º. Hence, the drying process needs to begin immediately. 2How will you know when everything is dry? We use sophisticated digital moisture meters designed to specifically check for proper moisture content in various types of building materials. Some materials will take on more water than others, and some materials can be more challenging to dry. 3Typical exclusions from insurance coverage. If you have a broken window or leaky roof and have chosen not to fix it for years, that may not be covered. Groundwater coming into your house from rain is typically not covered UNLESS you have a sump pump system that failed in the process. Sewer backups are covered if you have a sewer drain endorsement on your policy, otherwise it may be considered a maintenance item. The best thing you can do is ask us to help, we can call your agent or adjuster and see what we can find out. 4When does the repairs begin? Reconstruction activities proceed after approvals from homeowner and insurance company and LBR has a signed Work Authorization. During this process, LBR will submit all of the documentation required by the adjuster. 5Typical water damage claims that are covered. The phrase “sudden and unexpected” is typically used to determine what types of water losses are covered. Broken pipes, leaky ice-maker line, overflowing toilet, malfunctioning washing machine or dishwasher, ice dams in the winter, water damage from trees falling on the house during a storm, etc. all have a high likelihood of being covered. Most importantly, your insurance provider will have the answer. 6Who hires the restoration company? Most insurance policies contain language that points out that it is the responsibility the property owner, to take immediate action to prevent further damage once the water intrusion is noticed.